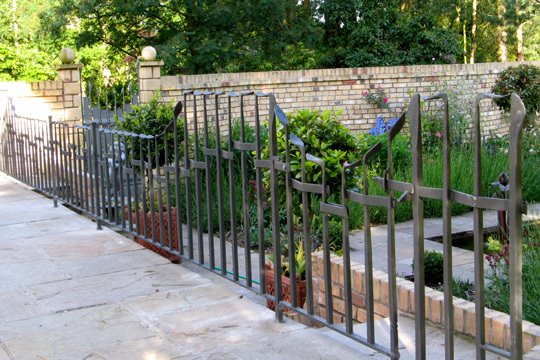 These bespoke garden railings are situated within a walled garden. They were designed to reflect the semicircular motif used throughout the garden. As with many of our designs, the railings don't use a conventional top rail, instead the forged steel uprights were shaped to line up and suggest this. The profile of this "virtual" rail picks up on the garden motif. The interweaving bands used throughout the railings were designed to complement this previously commissioned metal garden gate. A close inspection of the railings reveals that there are also two gates within the railings. These gates and their hinges, catches etc were designed to blend in seamlessly with the rails. 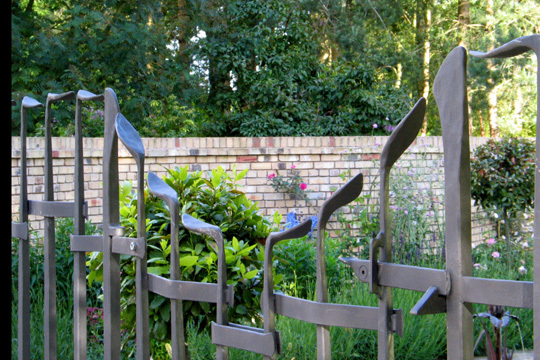 These garden obelisks were later commissioned to reflect these railings.